You might assume that Venice was the only place to see works by Venetian genius Giambattista Tiepolo. But if you’re hungry for the best kind of Baroque and not planning a trip anytime soon, don’t despair. Chances are there are inspirational Tiepolos in a museum near you. During the research for my novel about the Tiepolos, The Merchants of Light, I saw a wealth of works in different countries and mapped the location of many others. 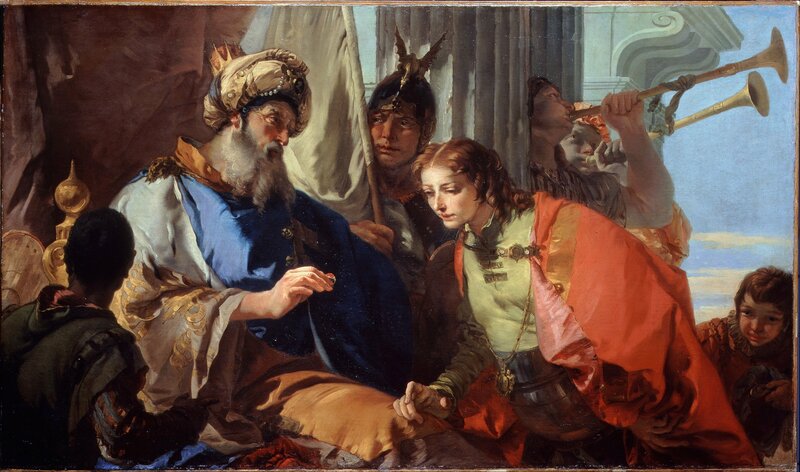 Here is the first in a series of brief guides to where you can see Tiepolo works for yourself. I chose my own city, London, for starters. London’s National Gallery holds a range of fine works by Giambattista Tiepolo, notably An Allegory With Venus and Time, intended as a central decoration for a ceiling in a Venetian palace, and the lively oil sketch for one of his many versions of The Banquet of Cleopatra. The Gallery also holds a number of works by Domenico Tiepolo including an impressive pair of oil sketches on the theme of the construction of the Trojan horse. All Tiepolos are on show in Room 40. In 1978, the Courtauld received a magnificent bequest from Count Antoine Seilern that included many Tiepolo paintings and drawings. Some of these works are on display, others are made available to members of the public on request. Among the highlights are a series of late oil sketches for altarpieces including The Immaculate Conception and Saint Joseph With the Christ Child and an early version of San Roch, Tiepolo’s patron saint. The jewel of this wonderful collection may be the small but scintillating oil sketch, Allegory of the Power of Eloquence. 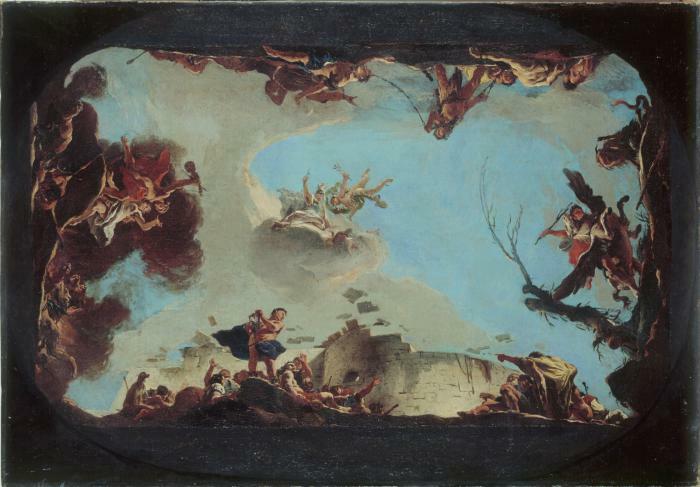 This is the preliminary design for Tiepolo’s first major work in fresco in Venice, the ceiling of the Palazzo Sandi. Small but special, Dulwich Picture Gallery has many attractions. It’s housed in a stately building designed by Sir John Soane for one thing. For another, it’s the world’s very first purpose-built public picture gallery. Dulwich has a few nice Tiepolos in its choice collection, including the vibrant oil-on-canvas work, Joseph Receiving Pharoah’s Ring. This is a sweet example of Tiepolo’s early mature style and it includes what looks like a self-portrait of the artist in the background. Check out the second trumpeter. The Victoria and Albert Museum has an excellent collection of Tiepolo drawings including two bound albums, The Cheney Albums, which can be seen by special request. 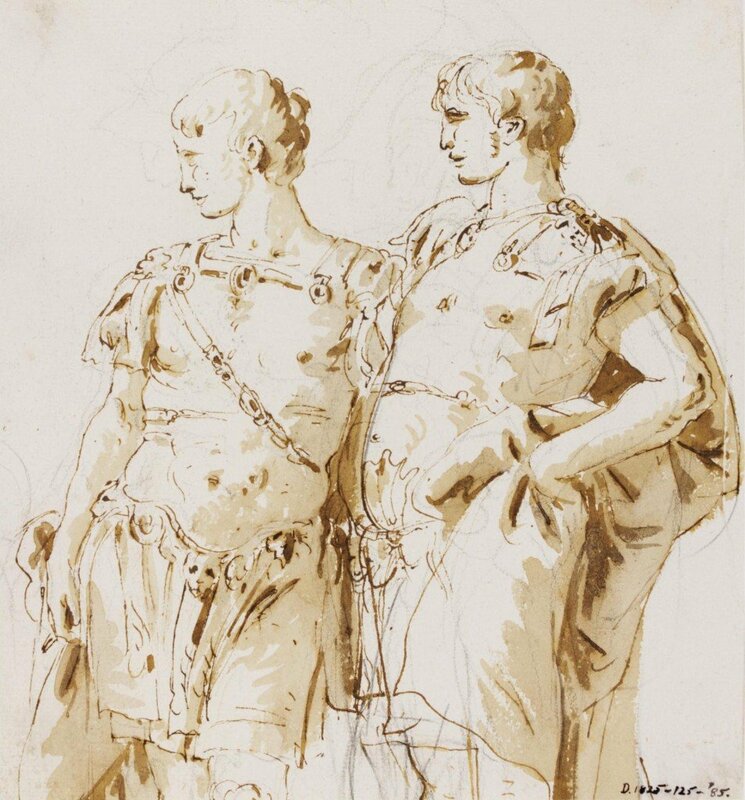 See and download the V & A’s Tiepolo drawings online. Housed in The V & A, the National Art Library holds an extensive collection of works about Tiepolo. Search their catalogue.